Nothing comes at night in this movie. Nothing. I can’t stress enough how misleading the title of this production is. Or how incredibly uneventful it is with nothing more happening throughout than the lead character having bad dreams. And that is exactly what ‘comes at night’: nightmares. They’re not scary either. Upon first seeing a poster for this I felt a flicker of delicious anticipation; this poster depicted a dark doorway with a male character facing it, holding a lantern. It looked spooky. Sinister. I couldn’t wait to see It Comes at Night. It looked set to be a fearful tale, yay! 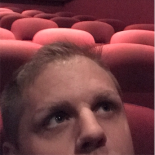 ..not only was I sat arms folded, bored shitless for 88 minutes, but it got to that point where I was aching to get out of the auditorium. That classic feeling of passing tedious stage and almost physically hurting.. Waiting outside a clothes store changing room for someone for a very long time. Sat on an unmoving delayed train for minutes – which seem like hours – when you have somewhere to be. Standing in a long queue at airport check-in. Waiting for a bus longer than you expected. It almost hurt, watching this movie. In fact, I simply do not have the enthusiasm to pen a full review of it so this one’s going to be short. But if there is just one thing I can say about this movie it’s that absolutely NOTHING comes at night. Nothing. A good 85% of the film is set in a remote cabin-style house with its occupants either sitting at the dinner table eating food, or wandering around the woods outside. I suppose the remaining 15% can include the mystery surrounding the young family who turn up on the cabin’s doorstep halfway through. Although they add nothing more to the wake-like atmosphere than good looks, there is a scene towards the end of the movie which spikes intrigue amongst the characters. Below is a screenshot of a brief text message conversation between myself and my friend Tony. Christ. Do I honestly have to do this? Edgerton creates good tension as father Paul. And Abbott as Will has a good energy about him too. The scene involving one kidnapping and tying the other to a tree is acted very well, the two men radiating a air of testosterone that would make Jason Statham back down. It’s emotional stuff, engaging too. Top marks for the boys. But the women.. Jesus, Keough is very good as young mother Kim. The penultimate scene just before the credits roll see Kim experience something no woman ever should – and it is heartbreaking. Just hearing that scream tear from the the woman’s throat sent a shiver through me. Heart wrenching stuff there. I cannot fault the talent of the cast at all. Sadly however, they were the exact sort of ensemble who should have been on stage in some sort of live theatre production instead of this. The talent was wasted here, these people were National Theatre material. The review ends here. I literally have nothing more to say, other than this movie sums up the phrase ‘don’t judge a book by its cover’ – the other way round. Outside it looked superb, inside the actual product was terrible. It wasn’t as though the performances were bad either, the cast were fine. It was the way the movie was set and how it was filmed which let it down massively. Very poor direction and lack of anticipation made It Comes at Night possibly one of the worst, most tediously boring movies I’ve ever sat through.